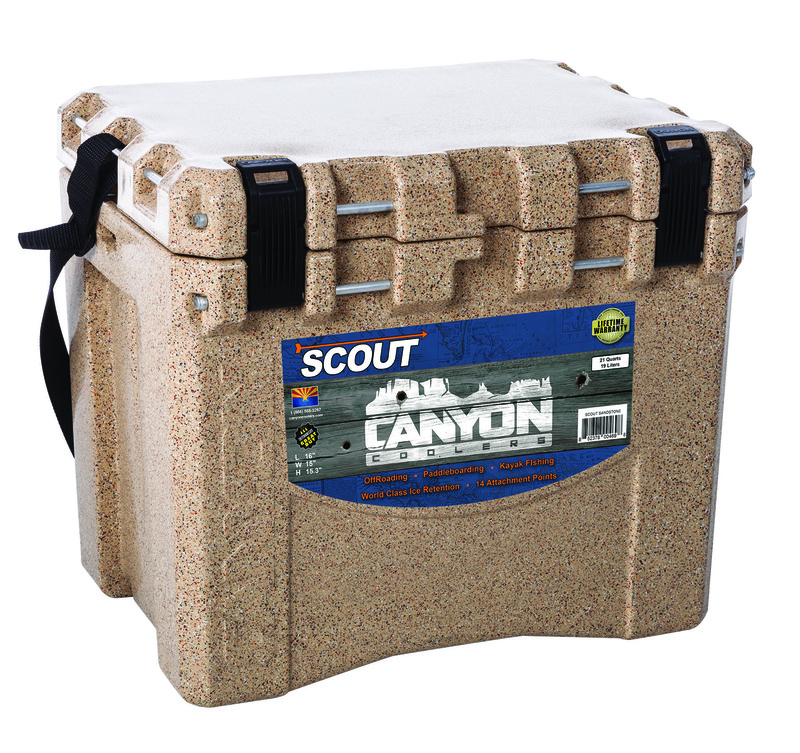 Canyon Coolers recently unveiled the toughest, coldest, little cooler to ever hit the market with the Scout. Small but mighty at 22qts, this cooler is perfect for kayak anglers. What happens when you cross Canyon Cooler’s smallest cooler, the Outfitter 22, with the toughest, most durable cooler on the market, the Prospector 103? You get the small and mighty 22-quart Scout. Measuring 13X15.3X18 inches at its largest spots, the Scout is small enough to be carried over the shoulder with a comfortable, Made in Montana® shoulder strap when full, and has 1.5 inch thick insulated walls to ensure extreme cold retention. No other premium cooler of this size on the market can boast these kinds of rugged features. The Scout sports a marine grade aluminum hinge and fourteen integrated marine grade aluminum tie down points that double as mounting points for the innovative Bungy Net System. The new Dura-Latches and No-Lose drain plug are recessed into the cooler so slipping the Scout into a tight spot on a boat or 4X4 is no problem. Unlike the Outfitter 22, the Scout is lockable and has a pending Grizzly Bear Certification. Rubber grip feet on the bottom make the Scout an excellent step or extra seat – no sliding around on the deck of your boat. The new Canyon Coolers Scout is backed by a lifetime warranty. Canyon Cooler’s new Adventure Series includes three seriously tough, ridiculously cold, premium coolers – The Prospector 103, The Mule 30 qt. Cube, and The Scout 22 qt. These coolers are designed with extreme adventure in mind – they sport thicker insulation and more durable hardware than any other premium coolers on the market today. The Adventure Series represents the true spirit of Canyon Coolers – adventurous, bold, and downright outrageously awesome. Canyon Coolers manufactures ridiculously cold, seriously tough coolers to keep food and beverages cold for not just days, but weeks. Ultra-tough in design from the drain plugs, latches, and handles these coolers are designed to take a beating from the hot sun in stride. Canyon Coolers are used by hunters, anglers, rafters, outdoor enthusiasts —and anyone else whose adventures are fueled by seriously cold refreshments. To learn more about Canyon Coolers’ full-line of premium, ridiculously cold and seriously tough coolers, contact Canyon Coolers at 866-558- 3267 or visit http://www.canyoncoolers.com/. St Croix is at it once again by updating their stellar line up of Mojo Bass Rods with their newest creation, Mojo Bass Glass. As anglers, we're always looking for that added little extra something to make our lure a little hotter, a little cayenne pepper added to it if you will. Lady anglers are forgotten about when it comes to quality fishing apparel. Gill recently introduced a performance Gill Rain Suit for women, by women. Tweetomatic error: Invalid or expired token. Yak Outlaws is dedicated to providing kayak and SUP anglers with the most up to date information on rigging tips, angling tactics, feature stories, and video to provide a more valuable experience when out on the water. Product reviews of the latest products and innovations will provide the angler the knowledge needed to become more adept.